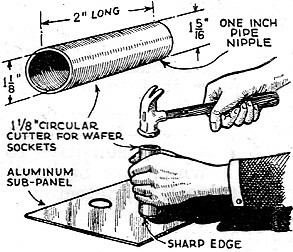 Even with all of today's prefabricated components, gizmos, and tools - at incredibly cheap prices - there are still many people who prefer to make their own non-standard parts and even tooling when tinkering on a project. 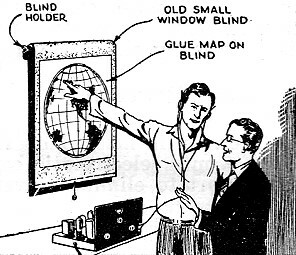 Many hobby magazines have monthly columns dedicated to hints, tips, shortcuts, ideas, etc. to solve, remedy, conquer, etc., the many kinks, problems, challenges, twists, hitches, snags, etc. of the task at hand. The aforementioned words can be found in the titles of those columns. 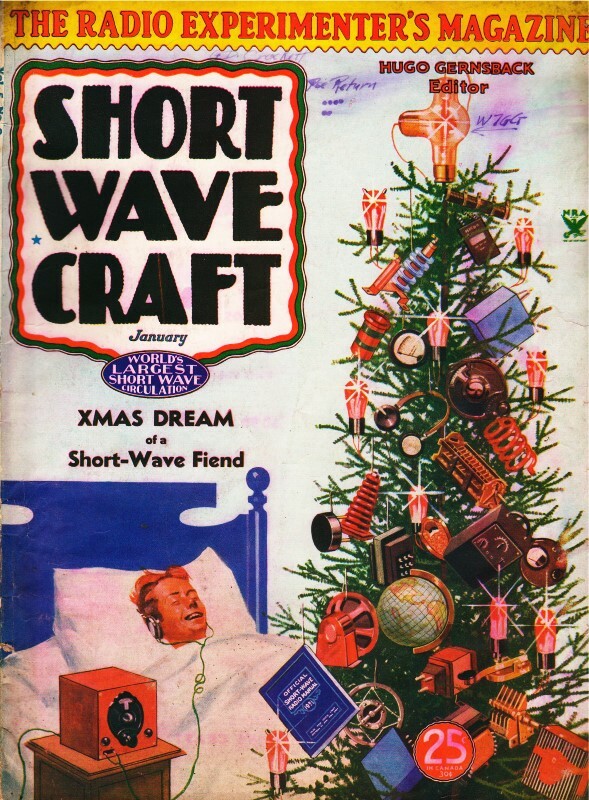 Short Wave Craft magazine ran a feature titled "$5.00 for Best Short Wave Kink" that rewarded readers for submitting nifty ideas. Contemporary magazines and websites still offer cash rewards, typically in the $25-$50 range. The Editor will award a five dollar prize each month for the best short-wave kink submitted by our readers. All other kinks accepted and published will be paid for at regular space rates. Look over these "kinks" and they will give you some idea of what the editors are looking for. 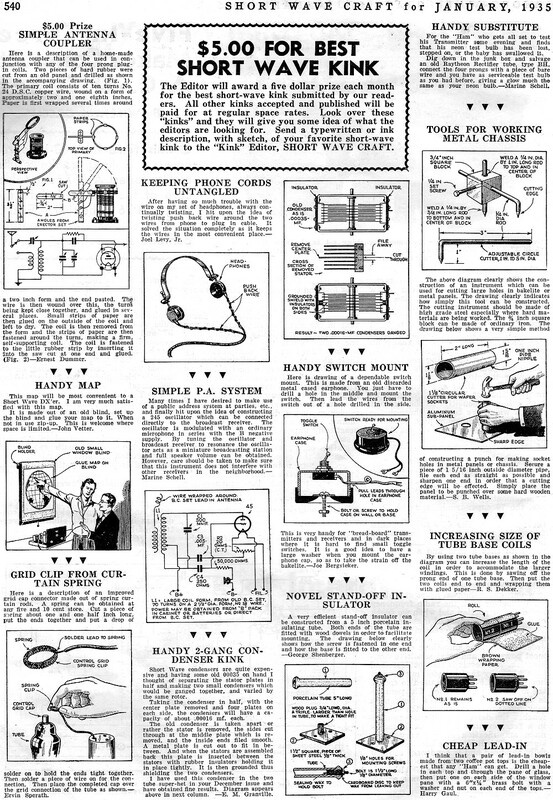 Send a typewritten or ink description, with sketch, of your favorite short- wave kink to the "Kink" Editor, Short Wave Craft. This map will be most convenient to a Short Wave DX'er. I am very much satisfied with this map. It is made out of an old blind, set up the blind and glue your map to it. When not in use zip-up. This is welcome where space is limited. - John Vetter. 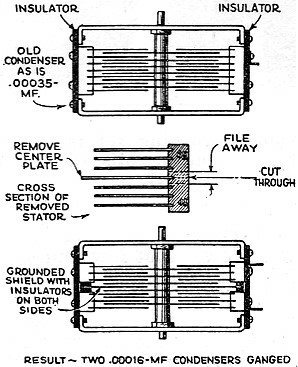 Here is a description of an improved grid cap connector made out of spring curtain rods. 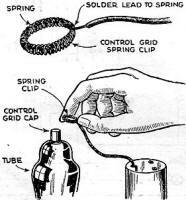 A spring can be obtained at any five and 10 cent store. Cut a piece of spring about one and one half inch long, put the ends together and put a drop of solder on to hold the ends tight together. Then solder a piece of wire on for the connection. 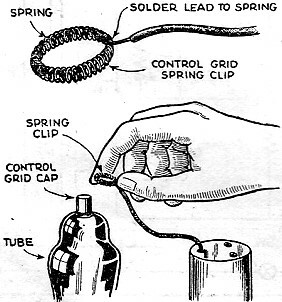 Then place the completed cap over the grid connection of the tube as shown. - Ervin Sperath. 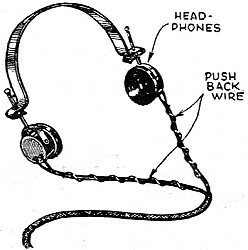 After having so much trouble with the wire on my set of headphones, always continually twisting, I hit upon the idea of twisting push back wire around the two wires from phone to plug in cable. It solved the situation completely as it keeps the wires in the most convenient place. ­ Joel Levy, Jr. 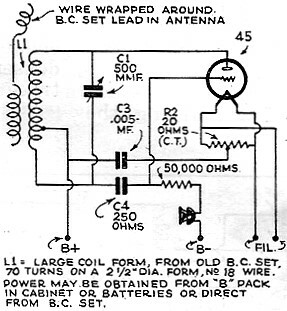 Many times I have desired to make use of a public address system at parties, etc., and finally hit upon the idea of constructing a 245 oscillator which can be connected directly to the broadcast receiver. 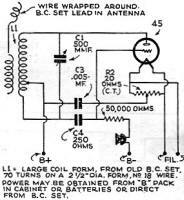 The oscillator is modulated with an ordinary microphone in series with the B negative supply. By tuning the oscillator and broadcast receiver to resonance the oscillator acts as a miniature broadcasting station and full speaker volume can be obtained. However, care should be taken to make sure that this instrument does not interfere with other receivers in the neighborhood. - Marine Schell. Short Wave condensers are quite expensive and having some old 00035 on hand I thought of separating the stator plates in half and making two small condensers which would be ganged together. and varied by the same rotor. Taking the condenser in half, with the center plate removed and four plates on each side, the condensers will have a capacity of about 0.00016 mf. each. 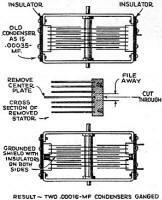 The old condenser is taken apart or rather the stator is removed, the sides cut through at the middle plate which is removed, and the inside ends filed smooth. A metal plate is cut out to fit in between. And when the stators are assembled back this plate is inserted between the stators with rubber insulators holding it in place tightly. It is then grounded thus shielding the two condensers. I have used this condenser in the two tube super-het in your December issue and have obtained fine results. Diagram appears above in next column. - E. M. Granville. Here is drawing of a dependable switch mount. This is made from an old discarded metal cased earphone. You just have to drill a hole in the middle and mount the switch. Then lead the wires from the switch out of a hole drilled in the side. This is very handy for "bread-board" transmitters and receivers and in dark places where it is hard to find small toggle switches. 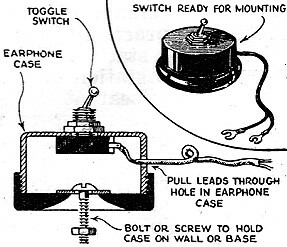 It is a good idea to have a large washer when you mount the earphone cap, so as to take the strain off the bakelite. - Joe Bergsieker. 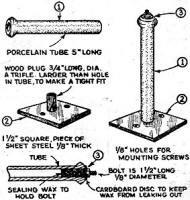 A very efficient stand-off insulator can be constructed from a 5 inch porcelain insulating tube. Both ends of the tube are fitted with wood dowels in order to facilitate mounting. 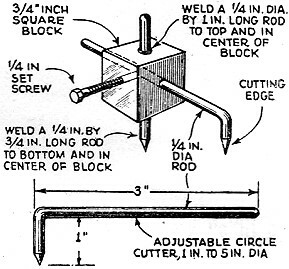 The drawing below clearly shows how the screw is fastened in one end and how the base is fitted to the other end. - George Shenberger. For the "Ham" who gets all set to test his Transmitter some evening and finds that his neon test bulb has been lost, stepped on, or the baby has swallowed it. 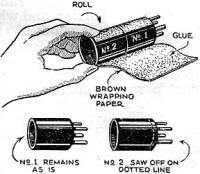 Dig down in the junk box and salvage an old Raytheon Rectifier tube, type BH, connect the four prongs with a piece of bare wire and you have as serviceable test bulb as you had before, giving a glow much the same as your neon bulb. - Marine Schell. 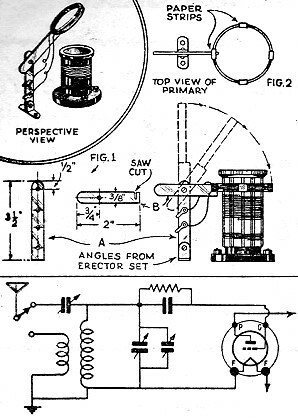 By using two tube bases as shown in the diagram you can increase the length of the coil in order to accommodate the larger windings. 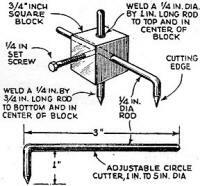 This is done by sawing off the prong end of one tube base. Then put the two coils end to end and wrapping them with glued paper - R. S. Dekker. I think that a pair of lead-in bowls made from two coffee pot tops is the cheapest that any "Ham" can get. Drill a hole in each top and through the pane of glass, then put one on each side of the window pane with a 6"x 1/4" brass bolt with a washer and nut on each end of the tops - Harry Gaul.